Blurb Description: From the critically acclaimed author of Lies We Tell Ourselves comes an emotional, empowering story of what happens when love may not be enough to conquer all. While Toni worries that Gretchen won’t understand Toni’s new world, Gretchen begins to wonder where she fits in Toni's life. As distance and Toni’s shifting gender identity begins to wear on their relationship, the couple must decide—have they grown apart for good, or is love enough to keep them together? I’ve never given much importance to gender, or sexuality or gender orientation on a personal level. I’m all for not following the standard norms of whom society says you should be, and if someone who was born male feels more comfortable female, who am I to judge them? If someone female is attracted to females, great for them, right? Like I said, I’ve always accepted that nobody is alike, and I have always been the Live and Let Live kind of person, but until What We Left Behind popped into my life, I never really understood how important all of it really is. Neither the words ‘discovering a new gender identity’ nor the various combinations of the standard gender symbols on the cover clued me in onto what this book is really about, which I will get to later. What I was expecting, however, was a standard college separation story with peer pressure and new friends and trying to figure out how your significant other fits into the new world you’re a part of and the person you’re evolving into. 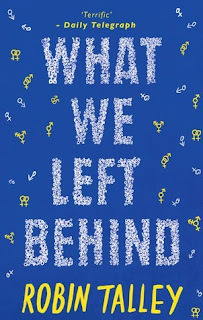 Which is going to be my life very soon, as I go off to college and half my friends travel half the world away, and I felt like What We Left Behind would be a brilliant book to read at this point. What I got however, was everything I expected and SO SO SO much more. Meet Toni/ Tony/ Anatonia. Sexuality: Genderqueer. College: Harvard. They’re that high school couple. The ones most likely to make it, and make it together. They never fight, they’re perfect for each other, and they’re gorgeous, smart, and going to the same city. Most of all, they’re crazy for each other. But college is a whole new life, and only the strongest survive. Told in dual viewpoints, get ready to feel. Get ready to feel how terrible Gretchen feels as she changes their plan and heads off to New York. Get ready to feel what it feels like when the most important person in your life feels like you can’t understand what you’re going through. Get ready to feel the workload of college, get ready to make new friends. Most of all, however, get ready to really feel what it’s like to not know who you are; to not be able to define who you are, gender oriented and otherwise, even if you already know who you are. Because that’s what reading Robin Talley’s What We Left Behind will do to you. Make you question, make you feel, and help you take your first step in understanding what it’s really like to not be black and white like society initially defined us to be. 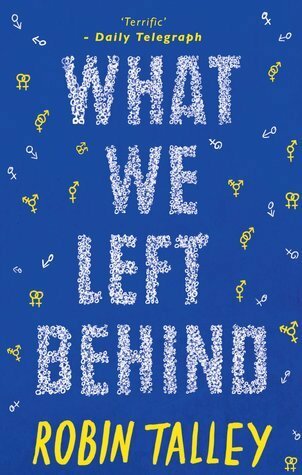 What We Left Behind is the most beautiful coming of age novel I have ever read, filled with some of the most important questions our generation has to answer for themselves. I couldn’t recommend it more! – 5 stars!